The waiting list for a slip or mooring in Burlington’s municipal marina is so long that, in some cases, boaters can’t remember how long ago the clock started ticking. Vermont’s most competitive real estate market is arguably in the Queen City’s front yard: Burlington Harbor. All told, there are 331 pending requests for space on the municipally owned waterfront. Some people are holding out for slips, which secure boats alongside a dock or pier; others have their hearts set on moorings, which are located out on the open water, accessible only by dinghies or rowboats. The wait averages nine years for a slip at the Burlington Community Boathouse, the most coveted location; it’s between five to seven years for moorings or slips at Perkins Pier. The demand-supply ratio has fueled rumors of traded slips and circumvented wait-lists. But the city has an economic incentive to accommodate all of these nautical types. If all 138 people on the waiting list for the Boathouse — the most expensive dockage in the city — received spots, they’d bring in more than $400,000 per year. The 111 people on the waiting list for Perkins Pier are worth an estimated $195,000, based on average rates across all boat sizes. There’s not much more room down the waterfront, either — boating is booming all along the eastern shore of Lake Champlain. Furthermore, the greatest demand — both in Burlington and other regional marinas — is for larger boats. Turnover tends to be among smaller slips and moorings. That tells marina managers that not only are people still boating with enthusiasm; they’re trading up. Or laterally. Malaspina now has a mooring, but no sailboat to occupy it. He owns a motorboat, which he docked for many years in Malletts Bay, before he caught the sailing bug about five years ago. Now that he’s got the spot for a wind-powered vessel, he plans to sell his motorboat and buy a sailboat. Even after eight years, though, long-suffering Malaspina says, “I didn’t think they’d call me this soon.” That’s because he’s been checking in every year to note his spot on the waiting list. Last year he was number 11, just two spots ahead of the year before. 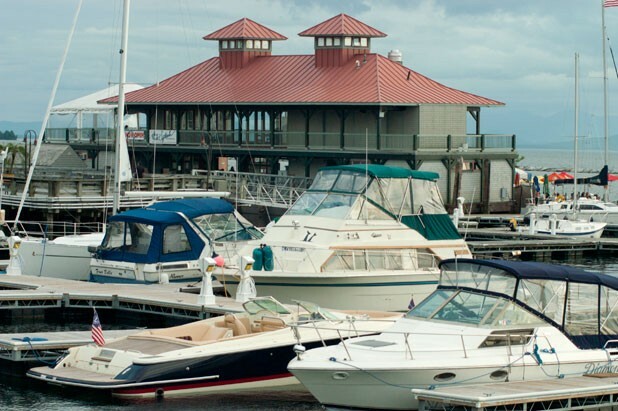 Burlington’s docks opened to seasonal boaters on April 23 — three weeks ahead of schedule thanks to the mild winter, says waterfront coordinator Erin Moreau. It was payback for last year, when Lake Champlain boaters lost a month because of record spring flooding. Then, on August 27, Tropical Storm Irene hastened the season’s end. Moreau, in blue jeans and topsiders, grabs a seat at a picnic table alongside the community boathouse. The Burlington Boathouse is actually a boat — or a barge, to be specific — which was floated up to Burlington from Texas in 1989. The words “Houston-TX” are emblazoned on the south face of the barge, which is hooked in place by enormous metal rings fastened to tall wooden pilings. Last year’s flood lifted the barge to within inches of the tops of those pilings. But all in all, Moreau says, Burlington’s marina weathered the high-water event pretty well: Unlike marinas with buildings vulnerable to encroaching water, the barge literally rode out the flood. Still, the facility is “maintenance intensive,” Moreau says: Exposed to the elements, the aging barge requires “constant and continuous” attention. The docks are in good shape, but Parks and Rec director Mari Steinbach says the boathouse kitchen got a $60,000 overhaul this year, and the facility is slated for an estimated $120,000 flooring and roofing repair under the city’s capital plan. Parks and Rec has additional improvements in mind, such as a renovation of the restroom and shower facilities, but there’s no money in the budget for it. “It’s just outdated.” Steinbach explains. “We’ve done a great job with very limited resources.” What’s more, expanding the city’s dockage and mooring facilities would require significant underwater construction to deal with navigational hazards. So far, there’s neither the money nor the plan in place to expand slips and moorings. Both Steinbach and Moreau defer to the mayor’s office when asked about future waterfront redevelopment. In the run-up to his election, Burlington mayor Miro Weinberger called for completing the “unfinished work” of transforming the lake’s edge into a modern, world-class waterfront. His plan included an expanded marina facility, additional boat slips, an extended boardwalk, and more shops and restaurants. His Republican challenger, Kurt Wright, specifically mentioned the epic waits for boat slips and moorings during the mayoral campaign. But there aren’t any firm plans in place for redevelopment yet: Weinberger says he has more thinking to do, and is waiting for the final report from PlanBTV — a community visioning and planning process that will yield the first-ever master plan for Burlington’s downtown and waterfront. Weinberger says the goal is to have a plan drafted by the end of the summer that Burlington can translate into new zoning rules. 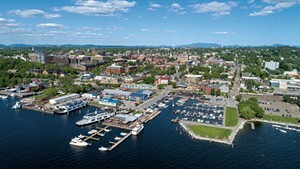 Strong demand guarantees that even with outdated facilities and limited services, Burlington can charge top dollar for dock and mooring space. Seasonal fees at the Boathouse run between $2000 and $4094, depending on dockage size and resident status. Perkins Pier rates are slightly lower, and moorings — which are roughly half the rate of Boathouse docking by foot — are the most economical: $45.50 per foot for Burlington residents. In addition to the seasonal spots, the marina also reserves a few slips and moorings for transient boaters who stay anywhere from one night to a month. Most come down from Montréal, but some hail from as far away as Florida; Moreau recalls one sailor who had made the “long loop” from Alaska. Meanwhile, local boaters are there to stay. Roughly five to eight spots open up per year, depending on the location. Moreau and the waterfront staff acknowledge the wait is long, but insist it’s fair. They match boat registrations to dockage contracts and troll Craigslist to prevent boaters from subletting slips or moorings. Jim Madison is a Shelburne resident who has moored his sailboat in the Burlington mooring field for 10 years. Every now and then he weighs the high price against the limited resources that Burlington offers. There isn’t a valet service to ferry boaters back and forth between the mooring field, for instance, or year-round boat storage. But for Madison, the location wins out. “If there’s no wind, you’re sitting on your boat with an amazing view,” he says. And when the breeze is up, the location is perfect for striking a broad reach into the lake. “You can go in any direction you want,” he says.